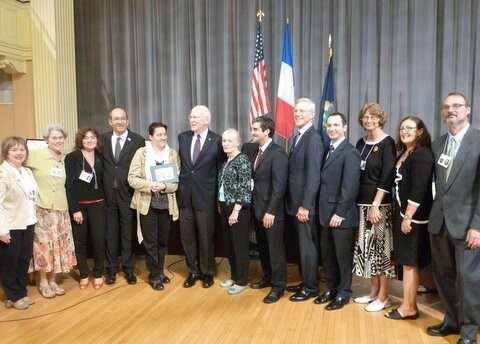 Members of Honfleur delegation pose with Vermont officials and Burlington sister-city committee. From left to right: Christine Mas, Lisa Schamberg, Lise Verroneau, Honfleur MR. Michel Lamarre and wife Corinne Lamarre, VT Sen. Patrick Leahy and wife Marcelle Leahy-Pomerleau, Burlington MR. Miro Weinberger, Ernie Pomerleau, CG. Fabien Fieschi, Dana vanderHeyden, Doreen Craft and Richard Gliech. This month marked the establishment of a Friendship Agreement (Charte d’amitié) between Burlington, Vermont and French sister city from which Samuel de Champlain historically set sail, Honfleur, Normandy. A three-person delegation accompanied Honfleur’s mayor Michel Lamarre on a visit to Burlington and surrounding areas, inaugurating a period of cultural and economic exchange between the two cities. Burlington-Honfleur Sister City Committee Corresponding Secretary, Richard Gliech, aided in translating the Charte d’amitié into an English language Friendship Agreement. Richard Gliech was also among those to welcome the French commission and organize tours of local mainstays, such as Burlington’s Intervale Center and Intervale Community Farm. The official visit, which included meetings with Burlington Mayor Miro Weinberger and Vermont Senator Patrick Leahy, lasted four days and concluded over local fare at the Inn at Shelburne Farms. View the Charte d’Amitié and Friendship Agreement.